The photo above was taken October 20 (today) at Lake Tomahawk in Black Mountain, about 15 minutes west of the Inn on Mill Creek. The Seven Sisters mountain range provides a very colorful backdrop this time of year as the fall colors start migrating down the mountains to our elevation (2,300 feet). The colors are brighter along the roads and on higher peaks around us, but green still shows in the landscape at elevations of 2,000 to 3,000. We’re on target to see peak fall colors at our elevation toward the end of October. The fifth week of Autumn started off with a bit of a chill in the air, with frosty mornings and Blue Ridge Parkway closures due to snow (!) and ice (!!). However, as the week progresses, we’re seeing more normal temperatures and the Carolina blue sky that everyone loves so much. Nice weather + fall colors = a great time for getting out to see fall foliage. Lookout Mountain in Montreat — Lookout Mountain literally looks out over the towns of Montreat and Black Mountain. (To see where it is and what the view looks like, check our Lookout Mountain Hike blog post from September.). A hike up the mountain will reward you with some gorgeous views of fall foliage from an elevation of roughly 3,600 feet. Lake Tomahawk Park in Black Mountain — For a leisurely stroll, try the half mile loop around Lake Tomahawk north of downtown Black Mountain. As you can see from the photo above, the Seven Sisters peaks, in the 3,500- to 5,000-ft. elevation range are showing some beautiful colors right now. Looking Glass Rock near Brevard — At an elevation of almost 4,000 feet and spectacular views, Looking Glass Rock is one place to see fantastic fall foliage in Pisgah National Forest in mid-October. 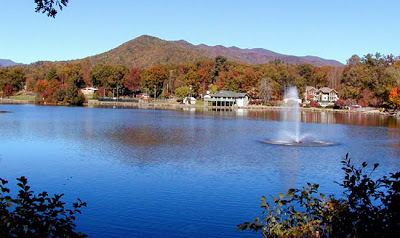 It’s about 45 minutes from Asheville, and the drive is a scenic one on NC-280 toward Brevard, then taking a right on US-276 and then a left on Forest Road 475 (watch for the sign for the Pisgah Center for Wildlife Education and State Fish Hatchery). Part of this route is a detour for the current closure on the Blue Ridge Parkway. RomanticAsheville.com and HikeWNC both have great descriptions of the hike. Next week, we’ll highlight fall color viewing opportunities around Asheville, North Carolina, including Biltmore Estate and the North Carolina Arboretum…stay tuned! This entry was posted in Uncategorized and tagged Autumn / fall foliage, Black Mountain, Blue Ridge Parkway by Inn on Mill Creek. Bookmark the permalink.